On 1st October 2015 at 11:00am, the statue was re-dedicated at a service conducted by the Revd. Canon Andrew Wickens. 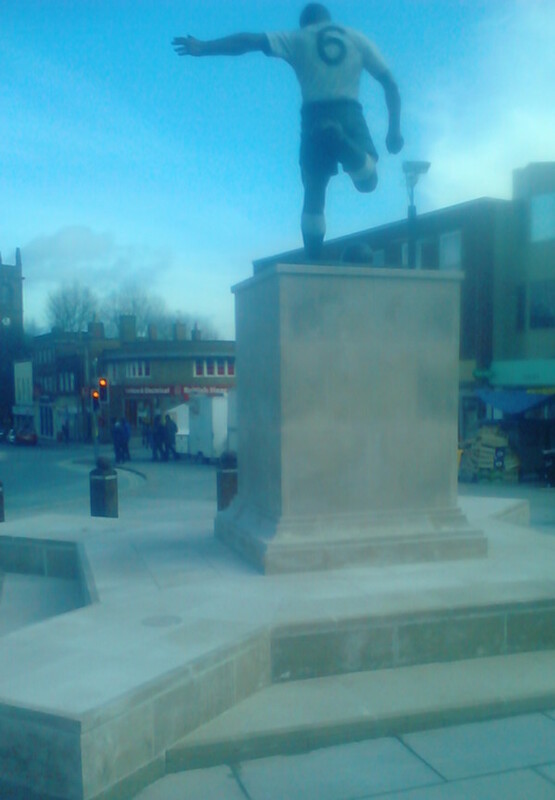 FEB 2015: Duncan’s statue is back! It has been in storage while a major £6.7million redevelopment of Dudley town centre has been under way. 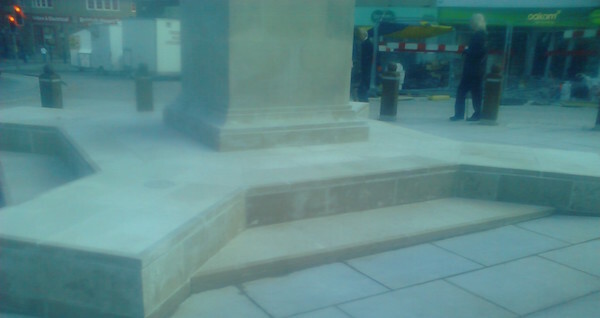 But now that work on the market area is nearing completion, the statue is being put back however it will not be in its previous location. It will be erected near the top of New Street, where the now-demolished toilet blocks used to be. Scroll to the bottom for photos and video! 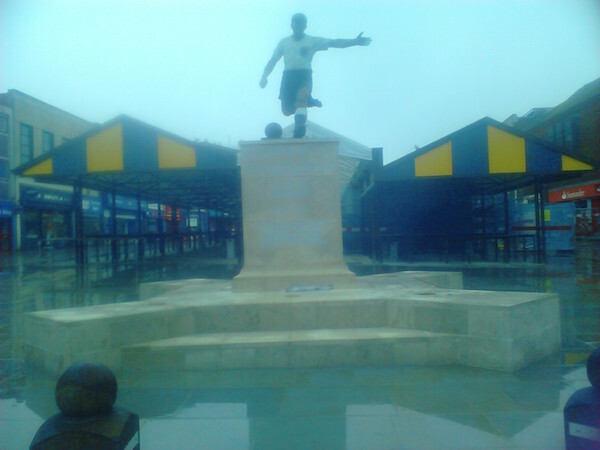 On Thursday 14 October 1999, a statue commemorating the Dudley born footballer Duncan Edwards will be unveiled by his mother, Mrs. Sarah Edwards and his former Manchester United and England colleague Sir Bobby Charlton. 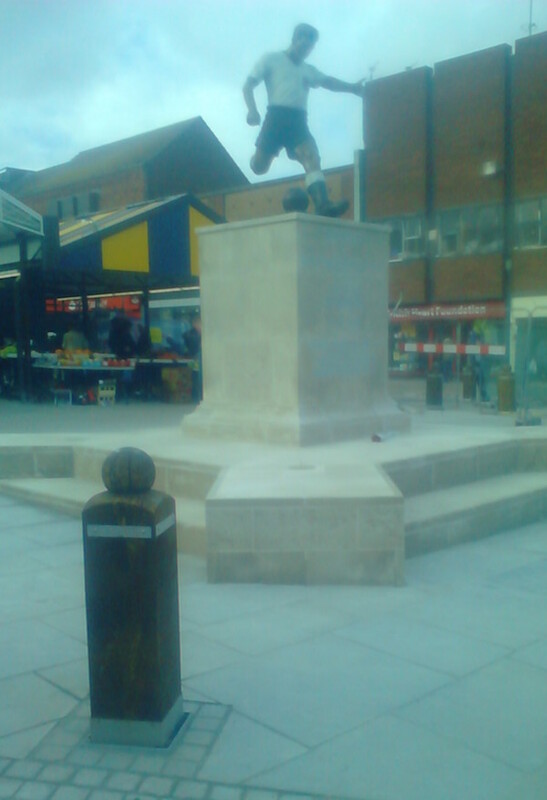 Dudley Council has commissioned the statue, which will be erected in Dudley Market Place, as a tribute to the footballing legend who died in the Munich Air Disaster of 1958 and who is fondly remembered as one of ‘Busby’s Babes’. The day will ‘kick off’ at 11am with a display of football skills by local schoolchildren. At 12.30pm the Mayor of Dudley, Councillor Fred Hunt will invite Sir Bobby Charlton onto the stage to share his memories of Duncan Edwards with the assembled crowd and invited guests. The statue will then be unveiled and will be followed by a short dedication in honour of Duncan and the commemorative statue by the Reverend Geoffrey Johnston, the vicar of St. Francis’s Church, Dudley. As a youngster Duncan played for Dudley Schoolboys, Worcester County XI and the England under 14 team. He signed a professional contract with Manchester United in June 1952 (4 months before his 16th birthday) and went on to make 151 appearances for the club and 18 appearances for the full England team. Those who saw him play, and because his life was cut short there were comparatively few, speak of a colossus who comes just once in a lifetime. As the journalist Michael Henderson put it: "Men have grown old with his name on their lips" and many of those men will be travelling to Dudley for the unveiling of the statue to celebrate Duncan’s life. They will be joined for the occasion by former Manchester United Manager, Wilf McGuinness. Dudley was and still remains very proud of its soccer hero. His grave in the Borough cemetery is constantly adorned with red and white flowers and the stained glass windows at St. Francis’s Church receive thousands of well wishers each year. After the unveiling Mrs. Edwards and her family, Sir Bobby Charlton, statue sponsors and invited guests will return to the Council House for an official reception. The photograph below shows the renowned sculptor James Butler, RA (Royal Academician) working on his maquette (model) for the full size bronze statue.